The Merchant City Festival is an important cultural event in Glasgow and it takes place in July each year over a four-day period. The goal of the festival is to showcase the very best of all of the attractions on offer in The Merchant City, the new cultural hub in Glasgow. The festival has received support and contributions in the past from such diverse and prestigious organisations as Scottish Opera, the BBC Scottish Symphony Orchestra and Scottish Ballet. Events can take place outdoors or within the walls of estate agents, hairdressers, caf�s or bars. The festival presents a cross-section of performance from visual arts and comedy to film, fashion and theatre and many of the events are free of charge. 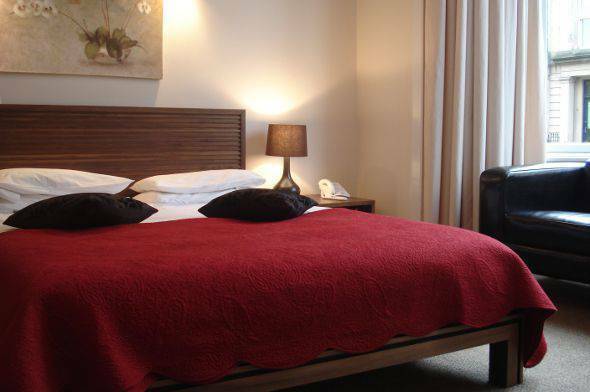 If you looking for a hotel near The Merchant City Festival, then look no further than The Sandyford Hotel in Sauchiehall Street, between the City Centre and the West End of Glasgow. We are conveniently located for visiting the city and the many attractions in Merchant City including the Merchant City Festival in July. Choose to stay in one of our 55 quality, affordable rooms with full Scottish breakfast included in our B&B accommodation packages. The room rates at The Sandyford are reasonable, but there is nothing cheap about the service we provide. To make a hotel booking near the Merchant City Festival, simply call our switchboard on (+44) 0141 334 0000 where a member of our reception staff will be happy to answer your query. Our reception desk is staffed 24 hours a day for your convenience, so there is always somebody around to help. It is also possible to make an online bed and breakfast reservation, with the help of the booking form on this website.